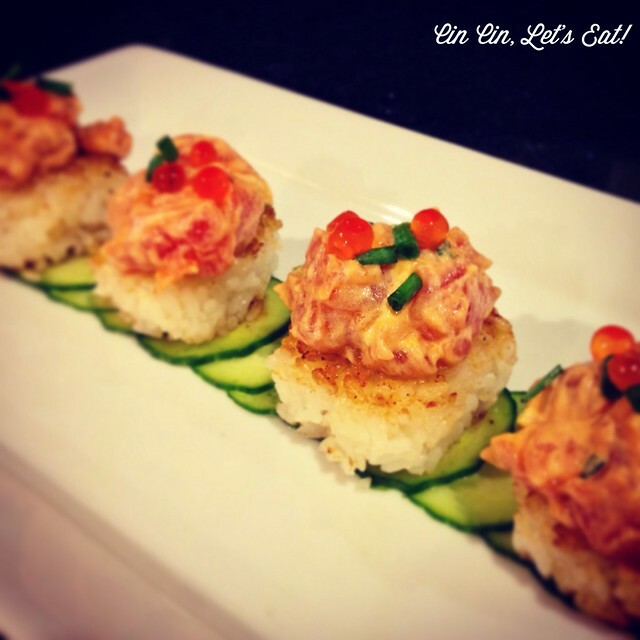 Spicy Tuna on Crispy Rice [recipe] – Cin Cin, Let's Eat! Oh how and where do I begin to express my love for Japanese food? Ever since our visit to Japan in the Spring, I’ve been making a lot of Japanese home style dishes at home. But when we eat out, we splurge for good sushi, but the problem is that it can get really expensive. (And yes, the Japan trip was AMAZING! I know it’s been 6 months but I promise to post sometime.) If you have access to a good Japanese supermarket, it’s very easy to pick up some sashimi grade raw fish and a couple more ingredients to have sushi night at home. 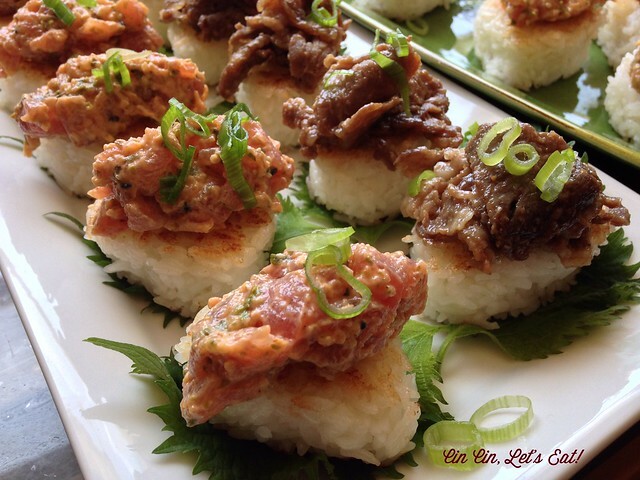 Spicy tuna on crispy rice is one of those dishes that’s actually very easy to put together, and with less than 10 ingredients! I make this dish all the time, pair with a bowl of miso soup and grilled shishito peppers or a salad tossed with ginger sesame dressing. 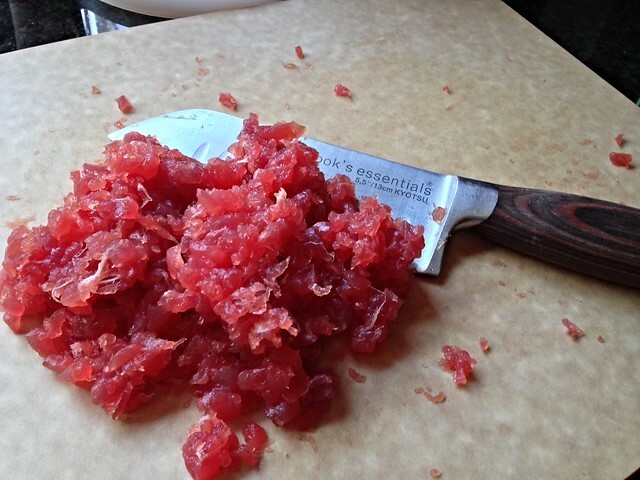 This is also a great appetizer to serve at dinner parties. Your guests will be so impressed! 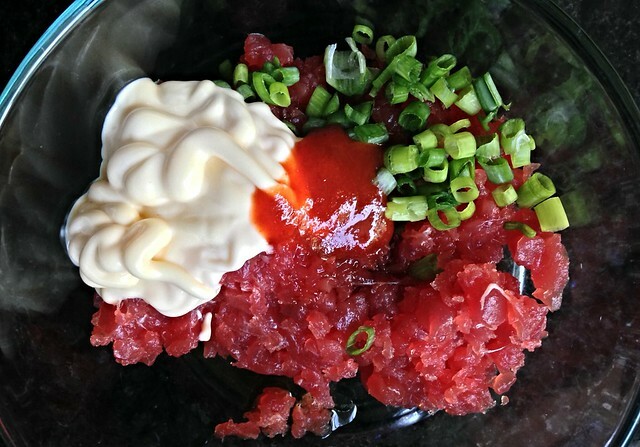 Add all the ingredients for spicy tuna in a mixing bowl. Mix well, refrigerate immediately. This can be made up to one day in advance. Cook the rice according to your rice cooker’s instructions. Use a rice paddle or spatula to fluff the rice and let it cool down to room temperature. When the rice is cool enough to handle, mold the rice into desired shapes. 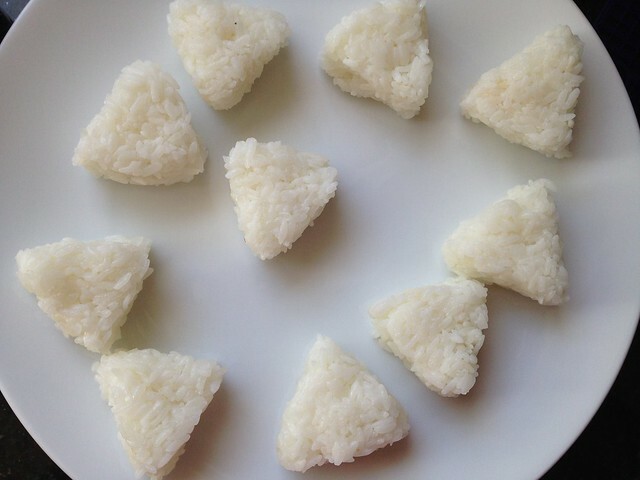 I like to mold the rice into triangles, 2″ sides and 1 ” thick. You can also buy rice ball or nigiri mold online or from Japanese supermarket. Notes/Tips: Make sure the rice is packed very tightly or the rice ball will fall apart during the pan-frying step. If this is meant to be an appetizer, don’t make the rice balls too big (not like the usual entree size rice ball/onigiri because that will be very filling.) And have a bowl of water next to you to dip your fingers in to prevent the rice from sticking to your hand. You can make the rice a few hours ahead, and cover with a damp towel to prevent from drying. In a skillet, heat 1 Tbsp cooking oil with 2 Tbsp of butter over medium heat. 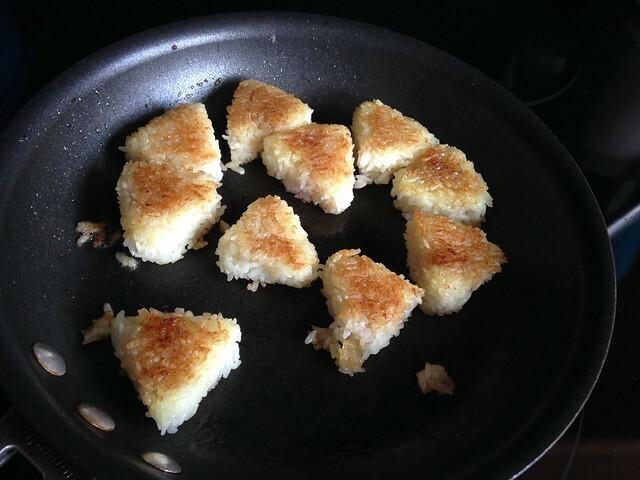 Add the rice triangles to the pan, 2-3 minutes per side until golden and crispy. Once golden, brush each side with a light coating of soy sauce and cook another 30 seconds per side. The soy sauce will help deepens the color and adds to the flavor aka the umami factor. 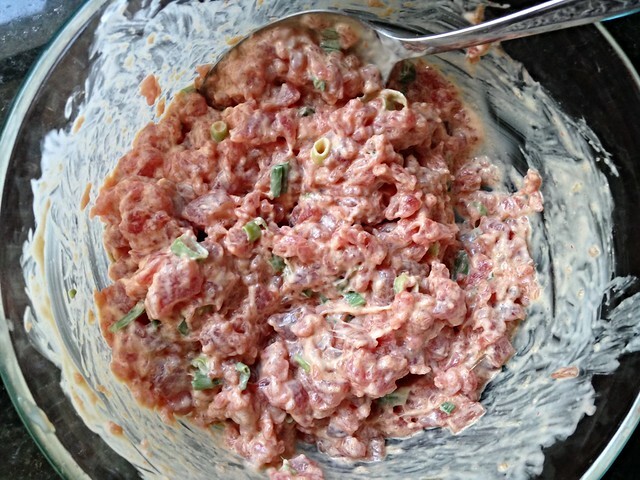 Top with the spicy tuna and scallions. Decorate with sliced jalapenos if you want more heat. Serve immediately. If you like chunkier texture, just dice the fish into 1/2″ or 1/4″ dice. Be sure to cover these up with a damp towel or the rice will be all dried up and hard. The soy sauce will really help the rice balls to brown. Crispy rice is so delicious! These were from a recent party. That’s crispy rice on the left and gingered beef on the right. 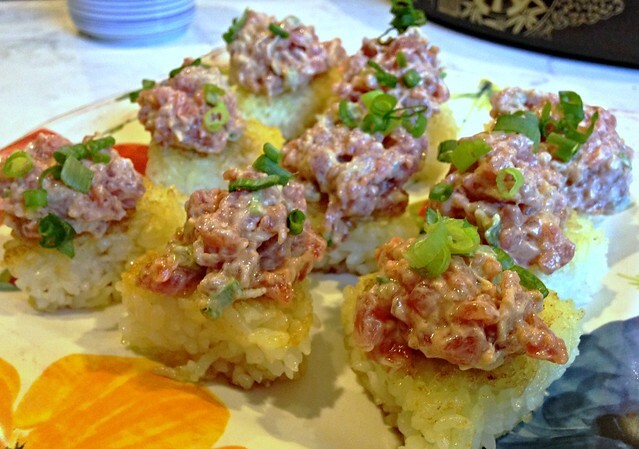 Both goes perfect with the crispy and buttery rice. I placed the sushi on top of shiso leaves. They’re not just for decoration! Japnese food is one of my favorites! Can’t wait to make my own.